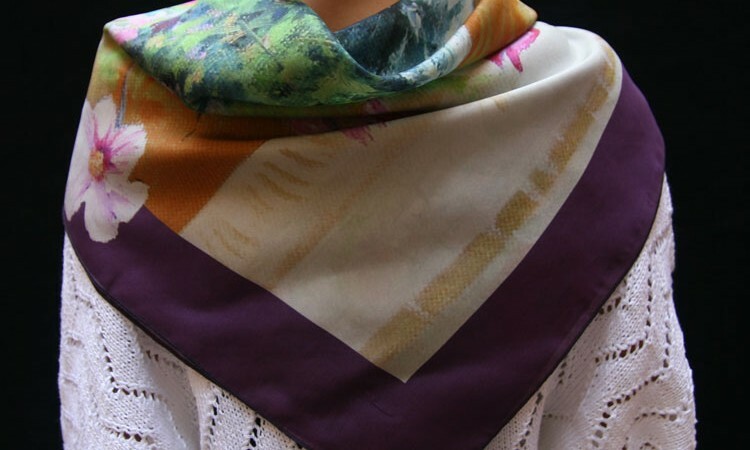 All our scarves are custom–printed in high definition for vivid colors and fine details, on 100% mulberry silk fabrics. Then they are hand-hemmed or machine-hemmed with care. Our scarves are 100% made in Europe. We create beautiful custom silk scarves for professionals an companies in diverse fields. Series and collections start at a dozen units up to several hundred units. Artists, art galleries, museums, wishing to reproduce their artworks on quality accessories and wearable items. Thanks to our innovative process, no need to order large runs to obtain professional quality. Companies of all industries looking for corporate identity quality items for industry shows, staff uniforms, clients’ gifts, etc. Forget about a one-color logo printed on a solid color background, the most sophisticated designs will print perfectly, and more colors will not cost more. Our custom scarves are also available as unique pieces. A custom-made silk scarf is a an exclusive special present for everyone who loves a beautiful personalized accesory. Professionals who wish to test the concept often order a couple of pieces to start. Unique pieces and sets of 2 or 3 scarvesare available in Fibra Creativa online shop. The quality is exactly the same as with larger orders, except the latter enjoy an even larger choice of silk fabrics and hems. 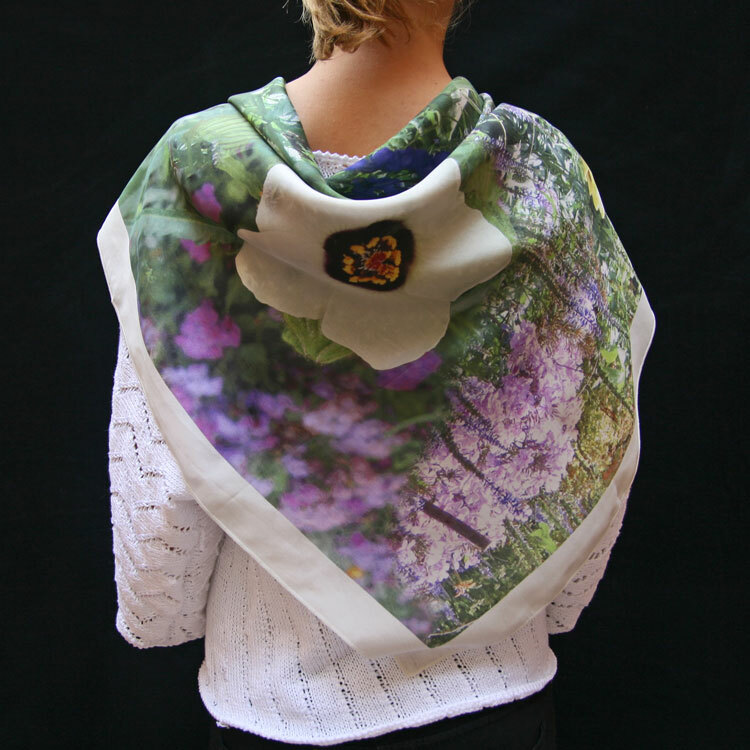 You do not need any experience in textiles, printing or sewing to create your own beautiful scarves. We take care of everything for you. Many of our clients have never created a scarf before. You only need to send us your image(s), we will ship the finished scarf to you. 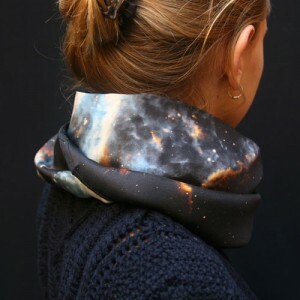 First you need to decide which images you want to print, and what type of scarf you want to create. On this page and the next, you will find detailed information about the choices of scarf sizes, fabrics and hems. If you need help deciding which type of scarf will best suit your project, or adapting your images to obtain the best results on the chosen scarf, just ask, we are here to help. We strive to produce high quality silk scarves that you will be proud of. Square scarves: 45×45 cm, 68 x68 cm, 90×90 cm, 120×120 cm. Long scarves: 32×136 cm, 45×180 cm, 68×205 cm. For runs over 100 units, we can make special sizes on demand, up to 135cm on the short side. Yet, remeber that very unsuaual sizes might seem “weird” rather than original to your clients. We make scarves in a variety of silk fabrics; all are quality fabrics, each has its own characteristics and uses. Some fabrics are only available with a minimum order. Fibra Creative does not care to make polyester scarves, we prefer the real stuff. Our scarves are hand washable, and can be ironed on silk setting. Our scarves can be rolled by hand or machine-hemmed. Some double-sided models are machine sewn and turned over, then closed by hand. The choice depends on the fabric, we offer the hem style that best suits each silk type. Twill, satin, crepe silk: rolled by hand, machine-hemmed imitation hand rolled for the open scarves. Machine hem for double-sided scarves. Habotai 8MM: machine-hemmed or rolled by hand for the open scarves. No double-sided scarves. Silk Mouselin: machine hem on open scarves. No double-sided scarves. 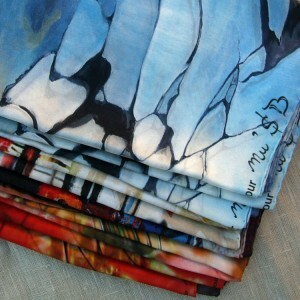 Our scarves are shipped ready-to sell or use, hemmed, ironed and folded in indidual clear pouches. In addition, we can provide boxes or black envelops for a more sophisticated presentation. Our scarves come with a fabric label sewn into the hem, whch indicates the required fabric composition (“100% silk”), origin (“Made in Spain”) and care symbols. The label is brand-neutral, it does not include the Fibra Creativa brand for bespoke silk scarves. For series over 100 units, it is possible to create and include your own brand label, but keep in mind that this implies an extra cost and production time. Our view is that labels on scarves are cumbersome anti-esthetical things of the past; clients might try to cut them and thus damage the hem. There is a muc simpler, elegant and permanet solution: inlcuding the brand name or signature in your design, as shown in the image to the left. A wide choice of bespoke silk scarves can be ordered in our online shop, as unique pieces. 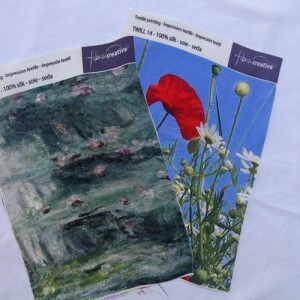 These are also available in sets of 2 or 3 scarves, at a reduced price. Starting with a dozen units for most models, an even wider choice of bespoke scarves and professional pricing, scaled according to quantity. A scarf collection can include several designs, for example a collection of 24 pieces can include 4 different designs, 6 units of each, at no extra charge. Extreme variety might incur an extra cost, and is rarely a good idea, except in very specific cases. Silk swatches of 15x20cm of printed silk can be ordered to help choose among the fabrics and see the print quality. We print the swatches specifically with hard-to-print designs, mostly photographs. Graphic designs are easiesr to print and show equally well. Swatches can be ordered online, and are shipped very fast. If you wish to see one finished scarf before ordering a large collection, the simplest way is to order a unique piece or a small set in our online shop. If the exact features you wish for your collection are not avaiable online, please contact us. Keep in mind though that the creating a single silk scarf takes abou the same time as creating a small collection, so ordering a test will more than double up the overall delivery time. For small collections and most designs, the print tests are not really necessary, we can tell ahead of time whether a design will print well. All files to be printed are reviewed by a human eye, when the output will not look good or when in doubt, we will warn you. If you wish to see a finished scarf without waiting for a bespoke piece, a fast solution is to order one of our designs in our online shop. These are in stock and ship quickly. The delivery time is about 4 weeks. It can vary betwnn 3 and 6 weeks depending on time of year and type of order. If you are in a rush or neeed to meet a specific delivery date, please contact us. If you hesitate between several sizes, the choice of fabric baffles you or you are not sure which type of scarf will best show your designs, do not hesistate to contact us. It will be a pleasure helping you bring your project to life! We can print almost any type of image. Art works generally give very good results, as long as we can work from a high quality photograph of the original.